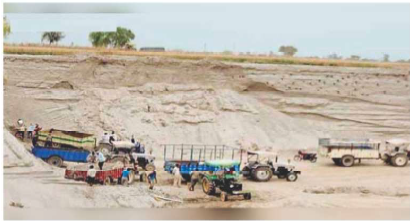 The department of mines, Government of Rajasthan, has offered a substitute to the river sand (bajri), the mining of which has been banned by the Supreme Court. Department engineers presented a model of ‘Manufactured Sand’, also known as M-Sand, as a substitute for the river sand that has caused environmental problems in Rajasthan. M-Sand is derived from locally available materials in abundance like granite, quartzite, basalt, silica and sandstones in different regions. The detailed display of the M-Sand was made during a conference on ‘Manufactured Sand as an Alternative to River Sand’ held at Rajasthan Institute of Public Administration (RIPA) organized by the Rajasthan State Pollution Control Board (RSPCB) in association with the department of mines and geology (DMG). The SC ban has slowed down the progress of almost 80% infrastructural projects. M-Sand can get the projects going as it causes minimal damage to the environment than the river sand. Rajasthan requires 37 million metric tonnes (MMT) of sand every year for its infrastructure projects. The estimated reserves of raw material for manufacturing M-Sand is 800 MMT. The department has already identified districts/regions with availability of raw materials. This sand is produced by crushing of rocks, quarry stones including waste into a size of 150 microns. The crushed material is segregated and is used for different applications on the basis of its size and composition. The sand obtained through this process is washed to remove impurities making it a durable and ideal for all forms of construction projects. contain any harmful material such as pyrite, coal, lignite, mica, shale, clay, alkali, soft fragments, sea-shells and organic impurities.